And How Do You Really Spell It? Copyright © 1996, 2004 Aaron Shepard. May be freely copied and shared for any noncommercial purpose as long as no text is altered or omitted. Narration serves as the framework of dramatic presentation. No full stage sets. If used at all, sets are simple and suggestive. No full costumes. If used at all, costumes are partial and suggestive, or neutral and uniform. No full memorization. 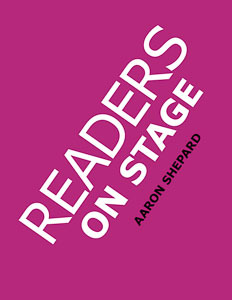 Scripts are used openly in performance. Reader’s theater was developed as an efficient and effective way to present literature in dramatic form. Today as well, most scripts are literary adaptations, though others are original dramatic works. Popular first in colleges and universities, reader’s theater has now moved to earlier education, where it is seen as a key tool for creating interest and skill in reading. Young people love to do it, and they give it their all—more so because it’s a team effort, and they don’t want to let down their friends! Repeated readings bring fluency, and if a script is based on an available book, kids want to read that too. What’s more, reader’s theater is a relatively simple activity for the teacher, with no required setup other than making copies of scripts. Reader’s theater has been found effective not only for language arts but for social studies as well. Performing stories based on another culture is one of the best ways for students to become interested in and familiar with that culture. That’s why it’s sometimes easier to call it RT!